The guiding principle of sustainable development is development that meets the needs of the present without compromising the ability of future generations to meet their own needs. 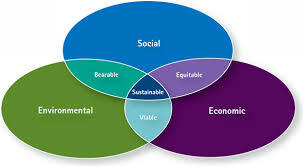 Sustainable development recognises the interdependence of environmental, social and economic systems and promotes equality and justice through people empowerment and a sense of global citizenship. Whilst we cannot be sure what the future may bring, a preferable future is a more sustainable one.